A culture dish mounted under a microscope for viewing. 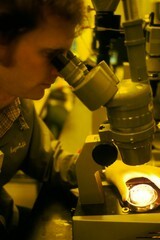 A scientist can be seen looking through the microscope at the culture dish. This test assays the effects of chemicals on cultured hamster embryo cells.